ARMCHAIR GOLF BLOG: Was Harrington DQ a Result of Online Job Scam? ACCORDING TO AN ANONYMOUS source, ARMCHAIR GOLF has learned that an online job scam may be contributing to the rash of rules violations reported by television viewers. A few weeks ago, Camilo Villegas was disqualified at the Hyundai Tournament of Champions in Hawaii. 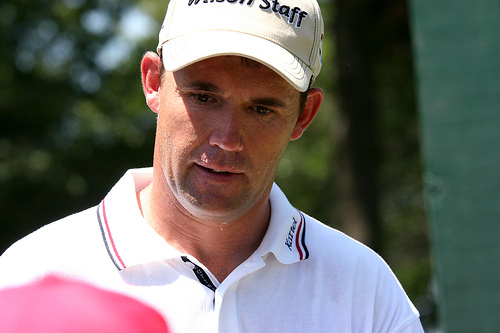 Padraig Harrington is the latest victim. The Irishman was disqualified on Friday at the Abu Dhabi Golf Championship. Some observers have thought these frequent rules incidents were coincidental. But ARMCHAIR GOLF has learned that something more sinister may be afoot, an online job scam that has armchair rules officials glued to their television sets. Work-at-home scams are nothing new. Yet, with unemployment rates at a 30-year high, people are much more susceptible to questionable money-making ploys. GET PAID HUNDREDS TO WATCH TV! “I’ve seen these work-from-home deals before and knew it was probably too good to be true,” the source said after not receiving a payout for reporting a violation. Apparently, tour players aren’t the only victims in these rules-obsessed times. So are innocent golf fans with too much time on their hands. Wow! When I signed up to be an "at home" football replay official I was promised that soon my income would be over $10,000 a week. Well, THAT check never seemed to be in the mail! Now I know why. Thank God my savings are safe with my good friend Bernie. Hmmm, come to think of it, he stopped sending me statements some time ago. Perhaps I should give him a call. bkuehn1952: The at-home football replay official sound like a great gig. If that check comes, please let me know if I can be your assistant. Well done, love a good joke at any time and this one is a gem. Will Tiger Regain His Dominant Form?